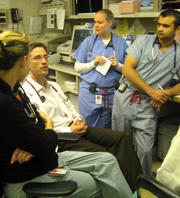 ER interns and residents discuss patient care. The New Year brings a new president and the prospect of change to the U.S. health care system. Reformers want more people to have affordable care and health insurance. That would mean fewer people relying on emergency rooms as their primary source of medical care. Massachusetts isn't waiting for the rest of the country on this issue. They're already pursuing universal health care for all residents. It hasn't been fully implemented yet, but ERs there are already changing how they deal with patients with chronic conditions. Reporter Curt Nickisch spent a Friday night following an ER doctor at Mass General Hospital. Perhaps the best approach is for states to tackle this issue on the state level. It seems like any national debate over health care is so hysterical and misguided. Maybe there should just be a national requirement for universal coverage and let the states iron out the details according to their own needs and circumstances. No one size fits all.